Reasonable people can have reasonable disagreements about police policies, use-of-force incidents, and other public safety issues. But there’s no excuse for vandalizing a police memorial to fallen officers. 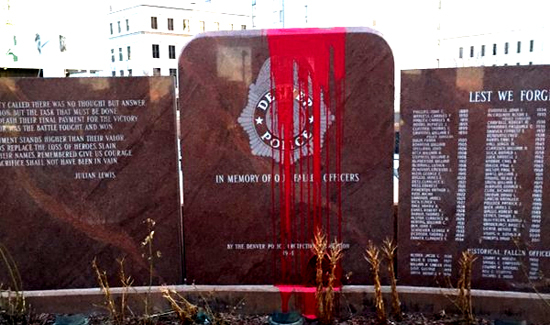 For the second time, cop haters have defaced a fallen officers memorial in Colorado. The police officer memorial at the Denver Police Department headquarters was vandalized with red paint overnight last Sunday, one year since a similar incident, Chief Robert White said. At a news conference Monday morning, White said the vandals were “disturbed individuals.” No suspect information has been released, though police said a picture is expected to be released later Monday because the memorial is under video surveillance.